I was thinking of which gifts I could make for my nieces and remembered this book I received for review. As I looked through it I realized I will be making bags for them AND for me in the next few weeks. 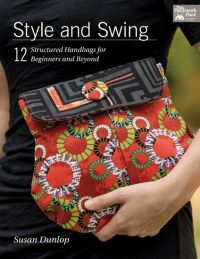 Style and Swing by Susan Dunlop showcases 12 projects including a wallet, satchel, tote, and clutch. I really liked the sections "Recommended Equipment and Tools" and the "Bag-Making Techniques": they take the guesswork out of choosing interfaces, boxing the bag base, and how to apply various bag closures. Each pattern provides detailed instructions and step-by-step diagrams. Susan's projects are great for every level of sewing skills, and we can mix and match features as we choose our favorite ones in each bag. I love this clutch on the cover because the pattern can be whipped up in no time at all. Sometimes it is difficult to find a bag that matches a particular outfit - this clutch would be a perfect solution! Yes, these are the ones I will tackle first. I always wanted to make a wallet but had never found a pattern I liked until now. My holiday line-up of projects is looking more attractive!